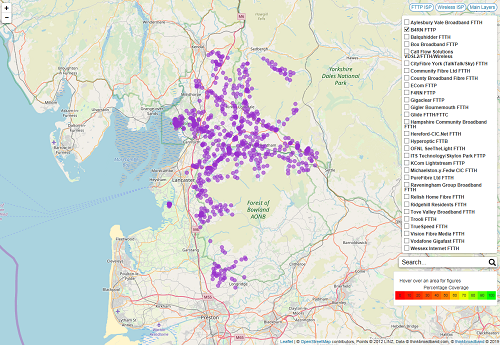 B4RN operates in some of the most rural parts of England and with some 9,500 premises passed spread over an area larger than that enclosed by the M25 the spread out nature of the fibre network they have built is readily apparent. B4RN is currently looking for funding to continue its expansion over the next few years and has a crowdfunding scheme open for those who want to invest in the project. Wow. unbelievably slow progress from the UK's premier Fibre to Forum operator. Yes, B4RN doesn't use premises past, it is a very deceiving method. B4RN only publish premises live on the network. Currently over 5000. When B4RN talks about take-up rates it is of course telling people who do the maths what the premises passed figure is anyway. 4. Give the background to Vodafone Gigafast network currently only being just over three times larger than B4RN in terms of premises passed.